Your dog’s body produces a number of extremely important proteins, called enzymes. One group of these are the digestive enzymes that participate in the breakdown and digestion of food. In humans, digestion begins in the mouth where saliva contains digestive enzymes. Dogs, however, don’t chew their food they gulp it down in chunks. Dog saliva serves in digestion only to moisten and lubricate the mouth and food as it is pushed back into the oesophagus for its journey to the stomach. The gastro intestinal tract has to perform many functions in order to absorb food then excrete the waste products. The mucosal layer lines the inner surface of the tube and is responsible for secretion and absorption of nutrients to the body. The surface area of the mucosa contains villi. Damage to the villi can cause villous atrophy which leads to malabsorption and diarrhoea. The major digestive and absorption processes occur in the small intestine. Several digestive enzymes are mixed into the food along with bile. These secretions are used to break down carbohydrates, proteins and fats into smaller molecules, which are then absorbed by special cells while the mixture is churned and pushed along by intestinal muscle contractions. Dogs intestines are relatively short (about five times their body length) so complex foods have a short time to be broken down and absorbed. By the time this mixture reaches the large intestine, the final leg of its journey, there should be little of nutritional value left. The large intestine completes the absorption of water and electrolytes and the remaining undigested food is then filtered and stored for elimination in the colon. When a dog suffers from malabsorption, as in the case of PLE, digestive enzymes fail to absorb protein into the body and it passes through the large intestine into the faeces. A forerunner to PLE can be inflammatory bowel disease (IBD). PLE is a condition in which protein is lost excessively into the intestine and can represent a number of abnormalities, which result in the loss of plasma proteins from the gastrointestinal tract. The loss of the healthy mucosal layer allows the leakage of vital protein-rich fluids. This is a hallmark of Protein Losing Enteropathy (PLE). The liver and other cleansing systems are unable to compensate for the loss. Mechanisms for gastrointestinal protein loss include lymphatic obstruction, mucosal disease with erosions, or ulcerations. PLE is probably related to immunological defence of the intestinal tract. This can be a late onset disease, which means that the dog develops it in maturity. Please refer to the Comparison Chart of Hereditary Diseases for signs and symptoms of this disease. Tests necessary to detect the presence of PLE are blood, urine and, if necessary, endoscope biopsy and Faecal investigation. The mode of inheritance for PLE is not known. At the present time there is no test available to show if dogs are carrying the deleterious (bad) mutations which cause this disease. The kidneys filter waste and extra fluid from the blood. The filtering process takes place in the nephron where microscopic blood vessel filters called glomeruli, are attached to fluid-collecting tubules. A number of different disease processes can damage the glomeruli, thereby causing kidney failure. Glomerulonephritis and glomerulosclerosis are broad terms that include many forms of damage to the glomeruli. Some forms of kidney failure can be slowed down but scarred glomeruli can never be repaired. This is what makes early detection so vital. Treatment given in the early stages of kidney failure depends on the disease causing the damage. Kidney failure may be ‘silent’ for many years. Approximately 70% of the kidney can be damaged before any physical signs show themselves. The glomeruli are the filters of the kidneys (imagine a water filter in a jug), they filter the blood and make urine. Normally, large molecules such as proteins, and cells such as red blood cells or white blood cells, do not pass through the filters and are retained within the blood because they are so important for health. Small molecules pass completely through the filters. Some of these are completely reabsorbed back into the blood since they are so important in maintaining the right chemical balance of the body e.g. glucose, salt etc. Other molecules, which are not required for body functions are passed freely into the urine, for example Urea, Uric Acid and Creatinine. There are two main effects of damage to the glomeruli. Substances, which are normally retained in the circulation escape into the urine through the filtration mechanism, one of these is Albumin. As a consequence, protein and red cells appear in the urine and can be detected by a dipstick urine test. Protein in the urine is called proteinuria. Normally there is very little protein in the urine. If the damage gets worse, the filter shuts down and that function of the kidney is lost. 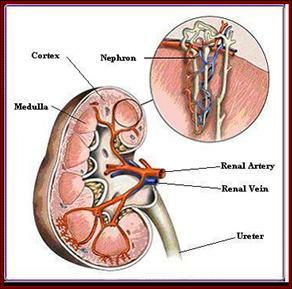 If sufficient damage occurs to enough glomeruli kidney failure may occur. Glomerulonephritis is the inflammation of the membrane tissue in the kidney that serves as a filter, separating wastes and extra fluid from the blood. Glomerulosclerosis describes the scarring or hardening of the tiny blood vessels within the kidney. This can be of late onset and the damage to the kidney may not show until the end stages of the disease. PLN is a condition in which plasma protein is lost to excess in the kidney. In the SCWT the most common disease causing PLN syndrome is glomerulonephritis. The term “glomerulonephritis” defines a group of inflammatory diseases of the kidneys affecting the most important functional components of renal tissue, the glomeruli and adjacent structures. There are several immune mechanisms involved in this inflammatory disease. SCWTs affected with PLN have damaged glomeruli because the ‘holes’ in the basement membrane are too large and allow more than waste to pass through. One of the larger molecules that pass through the faulty membane is protein. That is why excess protein (Albumin) is found in the urine of SCWTs who have one of the diseases that causes PLN. A Urinalysis test is one of the key factors to show protein loss associated with PLN far earlier than in a blood test. Tests necessary to detect the presence of PLN are blood, urine and if necessary, endoscope biopsy. Go to the Testing Protocols page for further information. The mode of inheritance for PLN is not known, but in 2012, Dr Paula Henthorn and Dr Meryl Littman at the University of Pennsylvania School of Veterinary Medicine (Penn Vet - details click here) identified mutations in two genes associated with PLN. For the PLN-Variant Genes Test it is preferred that Penn Laboratory (PennGen) is used, as this enables continuity of research. In Europe and Scandinavia Laboklin Laboratories also offer the test but the result does not directly aid this research. This table clarifies the reporting formats between PennGen and Laboklin tests results.